1940s vintage dress is such a beauty! 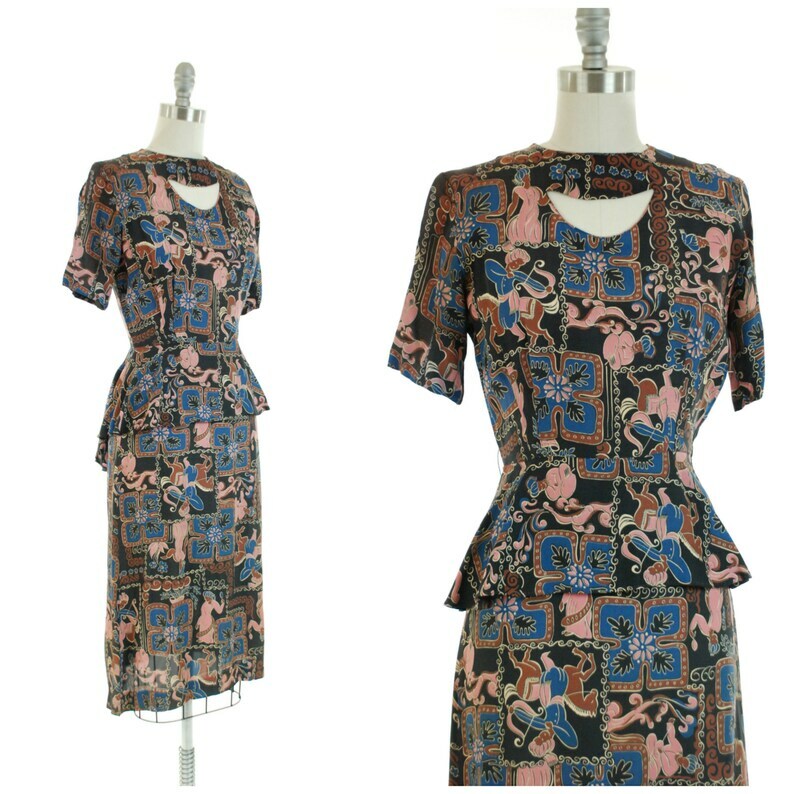 Sleek black cold rayon is richly printed with royal blue, deep brown, ivory and bold pink. The Arabian Nights theme is fantastic, featuring Scheherazade brushing her hair, archers on horseback, turbaned men playing Arabian guitar, and another standing in a garden. The pattern is bold and unique. The neckline has a crescent shaped cut out which seems to fit theme of the print perfectly. The peplum is fluttering and flirty, longer at the back. The dress closes with a sturdy side metal zipper and zipper at the back of the neck. It is missing the tag, but as I have a larger copy of the identical dress, I was able to identify the maker. This dress has been gently spot cleaned and is ready to wear. The colors have yellowed with age, but this wasn't corrected at the drycleaner. There is a bar of sunfade at the top of each shoulder, and some weakness to the fabric from too many years on a thin hanger. I have interfaced a 1 1/4" break at the top of the left shoulder, and interfaced two little holes and some weak material on the right sleeve. There is a tiny area of weak fabric at each side of the neck. The ivory in the print has yellowed a bit toward the hem. It still wears beautifully, and has been priced with flaws in mind.